The Indianapolis Colts today released tight end Konrad Reuland and waived wide receiver Daniel Anthrop, tackle Keith Lumpkin and running back Trey Williams. Reuland, 6-5, 254 pounds, signed with the Colts as a free agent on July 31, 2016. He has played in 30 career NFL games (four starts) with the Baltimore Ravens (2015) and the New York Jets (2012-13). Reuland has also spent time on the practice squads of Baltimore (2014-15), Indianapolis (2014) and the San Francisco 49ers (2011). Anthrop, 6-0, 193 pounds, signed with Indianapolis as an undrafted free agent on May 2, 2016. Collegiately, he played in 43 games (17 starts) at Purdue and compiled 113 catches for 1,384 yards (12.2 avg.) and nine touchdowns. Anthrop also rushed for 66 yards on 13 carries with one touchdown. Lumpkin, 6-7, 317 pounds, signed with the Colts as a free agent on August 21, 2016. He originally signed with the Buffalo Bills as an undrafted free agent on May 2, 2016 before being waived on June 13. Collegiately, Lumpkin started 38-of-41 games at Rutgers. Williams, 5-7, 200 pounds, was signed to the Colts active roster from the team’s practice squad on December 21, 2015. He has played in two career NFL games and totaled two carries for 12 yards. Last season, Williams spent time with the Washington Redskins (practice squad), Dallas Cowboys (active roster), New England Patriots (active roster and practice squad) and Miami Dolphins (practice squad). Collegiately, he played in 36 games at Texas A&M and totaled 204 carries for 1,343 yards and 18 touchdowns. Williams also added 38 receptions for 330 yards and one touchdown. The Indianapolis Colts today signed free agent running back Stevan Ridley. Ridley, 5-11, 220 pounds, has played in 60 career NFL games (26 starts) and totaled 685 carries for 2,907 yards (4.2 avg.) and 22 touchdowns in his time with the New York Jets (2015) and the New England Patriots (2011-14). He has also registered 27 receptions for 144 yards and seven kickoff returns for 152 yards. Ridley has seen action in five postseason contests (one start) and tallied 56 rushes for 242 yards (4.3 avg.) and three touchdowns and two receptions for 17 yards. He was a member of New England’s Super Bowl XLIX winning team. In 2015, Ridley played in eight games (one start) for the Jets and compiled 36 carries for 90 yards and caught four passes. Prior to New York, he appeared in 52 games (25 starts) with the Patriots and finished with 649 rushes for 2,817 yards and 22 touchdowns. Ridley also caught 23 passes for 142 yards and had seven kickoff returns for 152 yards. He saw action in five postseason contests (one start) and tallied 56 carries for 242 yards and three touchdowns and two receptions for 17 yards. Ridley was originally selected by the Patriots in the third round (73rd overall) of the 2011 NFL Draft out of LSU. The Indianapolis Colts today waived wide receiver Justin Berger, safety Alden Darby, guard Eric Herman, defensive tackle Ricky Lumpkin, tight end Mike Miller, running back Chase Price, cornerback Winston Rose, defensive end Delvon Simmons, wide receiver Josh Stangby and inside linebacker Junior Sylvestre. Berger, 6-2, 198 pounds, signed with the Colts as an undrafted free agent on August 22, 2016. Collegiately, he played in 27 games at Wyoming and finished with seven receptions for 90 yards and one touchdown and one carry for eight yards and one touchdown. Prior to Wyoming, Berger spent time at Diablo Valley (Calif.) Community College. Darby, 5-10, 194 pounds, signed with Indianapolis as a free agent on August 17, 2016. He spent most of the 2015 season on the New Orleans Saints practice squad. Collegiately, Darby played in 50 games (28 starts) at Arizona State and totaled 217 tackles (155 solo), 8.5 tackles for loss, 26 passes defensed, 10 interceptions, three forced fumbles and four fumble recoveries. Herman, 6-4, 320 pounds, signed with the Colts as a free agent on August 21, 2016. He spent time on the Baltimore Ravens practice squad in 2015. Herman was on the New York Giants active roster and practice squad in 2013 and 2014, but did not see any game action. He was originally selected by the Giants in the seventh round (225th overall) of the 2013 NFL Draft after starting 50 games at Ohio University. Lumpkin, 6-3, 300 pounds, signed a reserve/future contract with Indianapolis on January 19, 2016. He has competed in seven career games between the Arizona Cardinals (2011-12) and the Oakland Raiders (2013-14). Lumpkin has totaled 10 career tackles (seven solo) and 1.0 sack. Miller, 6-6, 255 pounds, signed with the Colts as a free agent on August 21, 2016 after being waived by the team on July 29, 2016. He originally signed with Indianapolis as an undrafted free agent on May 3, 2016. Miller played in 27 games (20 starts) at Taylor University and finished his career with 80 receptions for 959 yards and seven touchdowns after transferring following two seasons at Santa Monica College in California. Price, 5-8, 200 pounds, signed with Indianapolis as an undrafted free agent on August 11, 2016. Collegiately, he played in 50 games at San Diego State and totaled 377 carries for 1,896 yards and 12 touchdowns and 34 receptions for 247 yards and one touchdown. Rose, 6-0, 180 pounds, signed with the Colts as a free agent on May 18, 2016. Collegiately, he played in 25 games (14 starts) at New Mexico State and finished with 105 tackles (79 solo), 3.0 tackles for loss, 13 passes defensed, five interceptions and one fumble recovery. Prior to New Mexico State, Rose played two seasons (2011-12) at Los Angeles Valley College. Simmons, 6-5, 295 pounds, signed with Indianapolis as an undrafted free agent on May 2, 2016. He played in 27 games (24 starts) at Southern California, notching 101 tackles, 13.0 tackles for loss, 5.0 sacks, three passes defensed, two blocked field goals, two forced fumbles and one fumble recovery. Prior to USC, Simmons spent time at Texas Tech and played in 23 games (13 starts) and tallied 40 tackles, 7.5 tackles for loss, 3.0 sacks and two passes defensed. Stangby, 5-10, 185 pounds, signed a reserve/future contract with the Colts on January 5, 2016. He spent the final two weeks of the 2015 regular season on Indianapolis’ practice squad. Stangby previously spent time with the Portland Thunder of the Arena Football League in 2015. Collegiately, he played two seasons at Ottawa University (Kansas), where he totaled 84 receptions for 1,465 yards and 18 touchdowns. Sylvestre, 6-0, 242 pounds, signed with Indianapolis as an undrafted free agent on May 5, 2015. He spent the entire 2015 season on the Colts Injured Reserve list. Collegiately, Sylvestre played at Toledo and finished his career with 286 tackles, 7.5 sacks, one interception, three forced fumbles and eight passes defensed. This week’s “Back-Up(s) of the Game” presented by Venyu is cornerback Frankie Williams. It’s no secret the Colts are looking for a cornerback (or two, or three) to emerge. Injuries have hit the top seven corners on the roster. One young defensive back that has caught the eye of Chuck Pagano this preseason is Purdue product Frankie Williams. “Frankie Williams continues to be a guy that shows up every single day here and does exactly what you ask him to do and on game day you can see the results of his hard work and his preparation,” Pagano said last week. 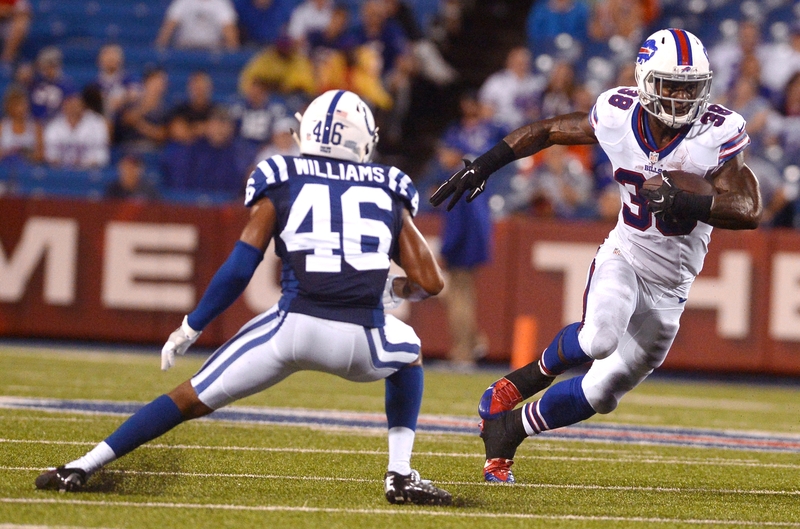 Williams was the Colts’ starting nickel back on Saturday against the Eagles. He played a team high 53 defensive snaps (88 percent of the defensive total, a very high percentage in the preseason), leading the Colts with five tackles and a pass deflection. The fact that Williams has made it this far is impressive. He was not even an immediate undrafted free agent signee by any NFL team. The Colts brought Williams in for a rookie mini-camp tryout. Williams flashed then and earned a roster spot. Thursday night in Cincinnati, Williams will try to turn one final opportunity into a spot on the team’s 53-man roster. The Indianapolis Colts today signed undrafted free agent wide receiver Justin Berger and waived wide receivers Marcus Leak and Andrew Opoku. Berger, 6-2, 198 pounds, played in 27 games at Wyoming and finished with seven receptions for 90 yards and one touchdown and one carry for eight yards and one touchdown. In 2015, he saw action in seven games and tallied two receptions for 35 yards and one carry for eight yards and one touchdown. Berger redshirted for the Cowboys in 2014. In 2013, he appeared in nine games and caught two passes for 19 yards. Berger played in 11 games in 2012 and collected three receptions for 36 yards and one touchdown. Prior to Wyoming, he spent time at Diablo Valley (Calif.) Community College. Leak, 6-0, 210 pounds, was signed by the Colts as an undrafted free agent on May 2, 2016. He participated Indianapolis’ offseason program and training camp but did not see any preseason game action. In three seasons at the University of Maryland, Leak totaled 55 receptions for 775 yards and six touchdowns. Opoku, 6-4, 225 pounds, signed with Indianapolis as a free agent on August 16, 2016. He saw action in the team’s preseason game against the Baltimore Ravens and assisted on one special teams tackle. Collegiately, Opoku played in 33 games at Delaware (2012-14) after spending time at Connecticut (2010-11) and Fork Union Military Academy in Virginia (2009). The Indianapolis Colts today agreed to terms with free agent cornerback Antonio Cromartie. Cromartie, 6-2, 210 pounds, has played in 158 career NFL games (133 starts) and totaled 389 tackles (340 solo), 31 interceptions (three returned for touchdowns), 115 passes defensed, two forced fumbles and five fumble recoveries (one returned for a touchdown) in his time with the New York Jets (2010-2013, 2015), Arizona Cardinals (2014) and San Diego Chargers (2006-09). He has also contributed on special teams and registered 60 kickoff returns for 1,436 yards (23.9 avg. ), seven punt returns for 40 yards and 17 special teams tackles. Cromartie has seen action in 11 playoff contests (10 starts) and collected 36 tackles (31 solo), three interceptions, six passes defensed and one forced fumble in addition to nine kickoff returns for 228 yards (25.3 avg.). He is a four-time Pro Bowl selection (2007, 2012, 2013, 2014) and in 2007 he was named First Team All-Pro by The Associated Press and Sports Illustrated. Among active NFL players, Cromartie’s 31 interceptions rank third while his 115 passes defensed rank seventh. In 2015, he started all 15 games he played in for the Jets and registered 33 tackles (31 solo), 12 passes defensed (team-high) and one fumble recovery. Cromartie was originally selected by the San Diego Chargers in the first round (19th overall) of the 2006 NFL Draft out of Florida State. The Indianapolis Colts today signed free agents guard Eric Herman and tackle Keith Lumpkin. The team also waived guard Donovan Williams and waived-injured tackle Kevin Graf. If Graf clears waivers, he will revert to the Colts Injured Reserve List. Herman, 6-4, 320 pounds, most recently spent time on the Baltimore Ravens practice squad in 2015. He spent time on the New York Giants active roster and practice squad in 2013 and 2014, but did not see any game action. Herman was originally selected by the Giants in the seventh round (225th overall) of the 2013 NFL Draft. Collegiately, he started 50 games at Ohio University and was a two-time Second Team All-Mid American Conference selection. Lumpkin, 6-7, 325 pounds, originally signed with the Buffalo Bills as an undrafted free agent on May 2, 2016 before being waived on June 13. Collegiately, he started 38-of-41 games at Rutgers. In 2015, Lumpkin started all 12 games at left tackle and was named All Big-Ten honorable mention by the league’s coaches and the media. He started all 13 games at left tackle for the Scarlet Knights in 2014. As a redshirt sophomore in 2013, Lumpkin started all 13 games at left tackle. He appeared in three games in 2012 after redshirting as a freshman in 2011. Williams, 6-3, 315 pounds, was claimed by the Colts off waivers from the Chicago Bears on August 15, 2016. He signed with the Bears as an undrafted free agent on May 16, 2016 and was waived on August 13. Collegiately, Williams started all 25 games he played in at Louisiana-Lafayette after transferring from Blinn Junior College. Graf, 6-6, 309 pounds, signed with Indianapolis as a free agent on April 20, 2016. He saw action in both of the Colts preseason games. Graf spent time on the Philadelphia Eagles active roster and practice squad in 2014, but did not see any game action. He was originally signed by the Eagles as an undrafted free agent on May 10, 2014. The Indianapolis Colts today signed free agent tight end Mike Miller and waived tight end Emil Igwenagu. Miller, 6-6, 255 pounds, re-joins the Colts after being waived by the team on July 29, 2016. He originally signed with Indianapolis as an undrafted free agent on May 3, 2016 before being placed on the team’s Non-Football Injury List on July 26. Collegiately, Miller played in 27 games (20 starts) at Taylor University and finished his career with 80 receptions for 959 yards and seven touchdowns after transferring following two seasons at Santa Monica College in California. Igwenagu, 6-2, 245 pounds, signed with the Colts as a free agent on July 19, 2016. He saw action in both of Indianapolis’ preseason games. Igwenagu has played in three career NFL games (one start) and previously spent time with the Detroit Lions and Philadelphia Eagles.